Stay at the classic Hilton New York Hotel and enjoy an incomparable experience shared by discriminating guests from around the world. One of the most storied New York hotels, this lavish property has hosted every U.S. President since John F. Kennedy, as well as an endless list of celebrities. 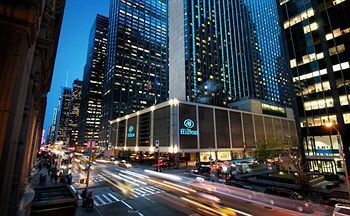 Built in 1963 as a showcase for international guests, this stunning New York City hotel has warmly welcomed families visiting the World’s Fair, representatives attending political conventions – and a certain "Fab Four" from England, coming to appear on the Ed Sullivan Show. With a multi-lingual staff of professionals, a wide choice of elegantly appointed NYC hotel accommodations, this extraordinary NYC hotel looks forward to continuing its legacy of service and guest satisfaction.